Mish's Global Economic Trend Analysis: China's Forex Reserves Drop Most On Record: What Does It Mean? Inflation Tsunami? China's Forex Reserves Drop Most On Record: What Does It Mean? Inflation Tsunami? Bloomberg reports China's Foreign Reserves Post Record Quarterly Drop on Yuan. 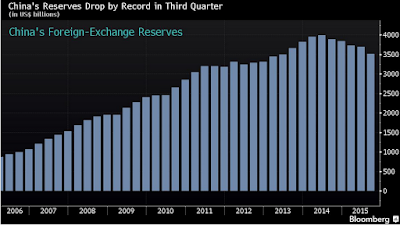 China’s foreign-exchange reserves fell by a record in the third quarter as the central bank sold dollars to support the yuan after a surprise Aug. 11 devaluation sparked the currency’s steepest slide in two decades. The stockpile plunged by $180 billion in the three months through September to $3.51 trillion, according to Bloomberg calculations based on data released by the People’s Bank of China on Wednesday. Note that China's Forex reserves are down about $500 billion from the 2014 peak. So what's it mean? "Bombshell Event of the Year"
Peter Schiff predicted a Bombshell Event in November of 2013. The following "bombshell" quotes are from The Schiff Report (11/22/2013). "If the Fed were to pull back, if it was to taper and eventually stop buying bonds, it's not only the absence of Fed buying that would crush the market, private buyers, particularly the leveraged speculators, why would anybody buy a 10-year treasury yielding what, 2.8%, or even a 30-year treasury at 3.9%, why would you do that?" "But here's the biggest bombshell of the week, maybe of the year. While everybody was focusing their attention on what the Fed didn't even say, they were pretending the Fed said they were going to taper ... nobody paid attention to what China actually did say. Because China announced the mother of all tapering. China finally came out and admitted that a further expansion of their foreign currency reserves is no longer in China's interest." "Now what does that mean? If China isn't going to expand its balance sheet anymore, that means it has to stop buying treasuries. .... [very long winded and incorrect analysis] ... The truth is, if China means what it says, the Fed is going to have to back up the truck. Not just not taper, but they are going to have to significantly increase the amount of monthly QE that they do, in order to pick up China's slack. That's what's going to happen in 2014. If Janet Yellen surprises me and tapers, she's going to be untapering quick, because she is going to have to pick up missing demand that the Chinese no longer supply." "When China stops expanding its balance sheet, that also means that the Chinese currency is going to appreciate, and China said it will allow that appreciation to happen. ... US is going to get hit with a tsunami of inflation. ... I think we have broken the short-term downtrend in oil ... Consumers not only will have to deal with higher interest rates, they will also have higher fuel bills." I believe we have a perfect 8-8, all from a single video. That said, I agree with Schiff's view that QE was unwarranted. The reason is not that it would unleash a "tsunami of inflation" but rather QE helped spawn bubbles that will pop. I also agree with Schiff on other things like free markets. But, another round of asset deflation is coming (I believe Schiff would agree), and in such an environment there is no reason to expect treasury yields to soar. China actually had to devalue the yuan because of market pressures. In August, Bloomberg phrased it this way "China Sells U.S. Treasuries to Support Yuan"
Capital flight in China is a huge problem, precisely where Schiff never would have thought. And here's a final bit of icing that China bulls need to ponder: The yuan overtook Japan’s yen to become the fourth most-used currency for global payments in August, rising to its highest ranking ever and boosting its claim for reserve status at the International Monetary Fund. The proportion of transactions denominated in yuan climbed to a record 2.79 percent in August, from 2.34 percent in July, according to a Society for Worldwide Interbank Financial Telecommunications statement on October 6, 2015. It is not easy to make predictions (especially about the future) to paraphrase Yogi Berra. I have made a number of questionable calls myself. In 2013 I sided with the ECRI on a recession, but at least we had a slowdown. I have another US recession call in now. It may or may not happen, but I did call a Canadian recession right on the nose this year. I called a top on the S&P 500 about 500 points ago. Oops. Painfully awful. I failed to see how another round of QE would ignite the markets. In retrospect, it think much of what we see has more to do with ECB president Mario Draghi's "whatever it takes" speech than anything the Fed did. Regardless, I missed it. I believe another asset bubble bust is around the bend. And if that is true, I fail to see how high inflation comes from it. I did call the 2007 top within a few percent. And I remained steadfast throughout that hyperinflation or even high inflation was an absurdity. Yet, I liked gold, and still do (but without ever putting any price targets on it). Beauty and accuracy is in the eyes of the beholder, but I point out my own mistakes or someone will do it for me. As hard as it is to get everything right, it is equally difficult to get everything wrong. But there it is, in video form. Bernanke is not the only one who needs to self-assess (see Ben Bernanke: Superman or Fool?). So do I, Peter Schiff, and everyone else in the industry, continually. Someday, one of these inflation tsunami calls will be correct, but I think we see another deflationary asset bubble burst first. Given monstrous levels of debt at the consumer and corporate levels, given the US is not Brazil, and given poor demographic characteristics, I am waiting for an explanation as to how we get an asset bubble burst that results in an inflation tsunami. I did not understand in 2004, 2008, 2012, 2014, and I still don't know now.